Not covered in this Soliongco narrative of the Quirino presidency is Agrarian/Land Reform, one of the most important issues of the time and that still remains being kicked around by our homeland’s rulers and thus, unresolved to this day. Historically, the agrarian reform problem was/is a lingering societal malaise that gave birth to several uprisings or rebellions; and which in the early 1950s significantly threatened the Quirino regime. Worried with the global upsurge of anti-colonialism, nationalism and the threat of world communism; and in the Philippines, seeing the Huk rebellion as part of this external or global concern (instead of solely an internal Philippine problem), the U.S. leveraged its foreign aid by demanding internal reforms in the Philippines. Thus President Truman sent an economic survey mission led by American banker Daniel W. Bell. Thereafter, the Bell Mission made the usual and general recommendations of better taxation, improved bureaucracy, etc. and alluded to land reform, but with a closed-door caveat from U.S. Secretary of State Dean Acheson to not seriously challenge the entrenched Filipino elite/oligarchs. As a follow-up to the Bell Mission, the Quirino regime signed on the so-called Quirino-Foster Agreement. The Agreement in which the Philippine government pledged to implement the necessary measures to fulfill the aspirations of the Filipino people while the U.S. will provide the required financial and technical aids. Where-from the U.S. sent Robert S. Hardie, who was instrumental in the efficient and effective implementation of land reform in post-war Japan, to do a similarly more detailed/specialized land tenure and development project in the Philippines. However, when submitted to President Quirino, Speaker Eugenio Perez, and then Congressmen Diosdado Macapagal, Jose Feliciano, Jose O. Corpus, with their landholding elite/supporters in government, i.e. Jose Yulo, Elizalde, Montinola, Cabili, Cuaderno, etc. all spoke and fought hard against the Report, even called it “communist-inspired.” These guys forgot or were ignorant that strongly anti-communist General Douglas MacArthur himself employed Hardie for reforming post-war Japan!! subsequently and officially shelved the Hardie Report into oblivion and dustbin of land reform history. In lieu of total land reform, partial land resettlement was implemented later by President Ramon Magsaysay The land resettlement project --hijacking the "land for the landless" rebel slogan-- sited in Mindanao was made for ex-Huks; and together with soldiers stopped the peasant uprising and the cry for total land reform. Overall, we can safely argue now that this Magsaysay resettlement solution was partial and short-term; and greatly contributed to the endless Mindanao conflict between Christians and the Moros - the original occupiers of the resettled lands. A solution that begot a new and continuing problem. Thus, the land reform issue, with increasing impoverishment for the peasants, extrajudicial killings of tenants/farmers, etc., 60+ years hence continue to the present day. In hindsight too, later self-proclaimed “Poor Boy from Lubao" President Macapagal would pay lip service to land reform (and in lieu guarantee the entrenched oligarchic status quo), as other presidents had done before; and after him --including his daughter President Gloria Arroyo-Macapagal-- would do. Similarly and predictably, we can not expect any better from the Aquino boy midway through his presidency, as we did not get any action from her "religiously Catholic" mom, Cora Aquino - who had the best opportunity, like Ferdinand Marcos, to implement radical reforms but did not, because bottom-line she/her family belonged to the landholding aristocracy/elite/class. What we like about President Quirino is his perfect equanimity in the face of public clamor that he lift the suspension of habeas corpus. We suspect that this quality of the President arises from his inability to hear any other voice save his and that of President Truman. We cannot force him to heed the country’s wish, for the simple reason that he knows best what is good for him. He has come to the conclusion that the suspension of the writ of habeas corpus is useful to him for deeply personal reasons. What right, therefore, do we have in suggesting that he does something against his interests? Without the writ, he is a virtual dictator. Already, his minions are arresting people for voicing criticism of him. Pretty soon, he will don the uniform, and speak from balconies. and there will be the inevitable goose-step. But we have a feeling President Quirino will not restore the writ. He will have ingenuous reasons to support his refusal. Even if 19-million Filipinos were to raise their voices for the restoration of their basic right, the President would be deaf. Therefore, we suggest that all our petitions be directed to president truman. perhaps, Mr. Truman will hear, and when he hears, he might speak. And when he peaks, President Quirino will surely listen --and hear. After a brief but painful illness, what should we hear but the disquieting news that President Quirino has been behaving in the manner of a boy who is being deprived of something which has only been loaned to him but which he has learned to prize as his own? We are referring of course to the tenacity with which the president is fighting to retain his emergency powers. Unless the man really wants to become a dictator in name as well as in fact, which we doubt, it is difficult, if not impossible, to understand his peculiar attitude. Because we are tolerant about matters concerning president Quirino, we can very well appreciate his desire to continue enjoying emergency powers. But tolerant as we are, we confess we were rather shocked to hear that His Excellency in effect threatened to use his constitutional right to impose martial law should Congress deny him what he wants. The authority to grant emergency powers to the Chief Executive belongs to Congress. In other words, in so far as emergency powers are concerned, Congress giveth and congress taketh away. If it is the opinion of Congress that President Quirino should no longer be clothed with emergency powers, we hardly think it proper for him to insist otherwise. When he said that Congress must take full responsibility for whatever might happen as a consequence of his being deprived of his emergency powers, he should have stopped there. It was the only apposite thing he could say under the circumstances. he had no business resorting to threats, nor had he the right to act as if it were the obligation of the legislators to be yes-men all their lives. In point of fact, we even think that it will be for his own good if he is divested of powers other than those provided in the Constitution. For one thing, he will never be accused of abusing what has been denied him. For another, it will be his supreme chance to show that even without emergency powers he can still rule like a statesman. The great tragedy of Elpidio Quirino who passed to his reward late yesterday afternoon is that of a man who allowed the pomp and glamour of power to dull his otherwise keen and observant mind. He never forgot, even for a moment, that he was President, and never did allow this fact to be forgotten by his followers and advisers. He was, in a manner of speaking, a captive of his great vanity. And because he was such a captive, he failed to hear the popular heartbeat. During his heyday, he was virtually insulated from the masses --to whose welfare he paid lip service --by a coterie of self-seeking advisers who massaged his ego to elephantine proportions. They told him nothing but the rosiest news and they brought him nothing but the most flattering reports of his great popularity among the people. All these, of course, was a great lie. But President Quirino had ceased to recognize the bitter truth; all he wanted to hear was sweet flattery. And of this, his so-called friends and advisers had an enormous store. They gave it to him thick and he accepted with grace and often with gratitude. Thus, towards the close of his career, he lost contact with the people. As a matter of fact, we even believe that he did not care what the people thought or how they felt. He would much rather hear the soothing words of the Malacanang courtiers. It would be a different story if President Quirino had peered through the walls of his study and seen what was happening outside. Certainly, he would not be such a sorry figure if he had the courage to know the unvarnished truth, if he had the moral strength to recognize the friends from the opportunists. His life in retirement must have been bitter indeed. For he was left virtually alone. Even the followers and self-appointed advisers he rewarded with jobs and opportunity for making money denied him the benefit of their company. In our search for understanding of the perennial predicament in our homeland, a visit to the history of how our past presidents led or, more aptly, ruled provides us some historical insights; that is, allow us to discern patterns and trends that we of subsequent generations can identify as permeating our present so-called national leadership. The late I.P. Soliongco wrote a series of articles about our post-WW2 presidents from the years 1946 to 1971, the year of his death. 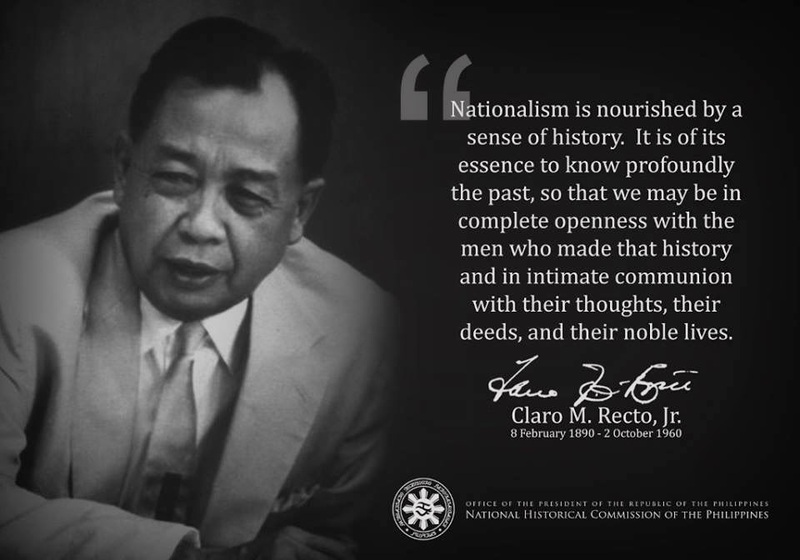 His articles though dated are so alive and resonate in the thinking Filipino mind, given that his critical analysis and observations are so relevant, 60+ years ago today. In his introduction to Soliongco's articles about our post-WW2 presidents (from 1946 to 1971), one of our great nationalist, the late Prof. Renato Constantino stated : " Soliongco's writings on post-war Philippine presidents are particularly enlightening because he always viewed them from the overall perspective of RP-US relations..."
“Salus populi suprema lex esto” or "The welfare of the people shall be the supreme law." Fast forward today, no post-WW2 Philippine president has so far acted according to that supreme law. The below link will show a short list of my past posts (out of 543 posts so far) which I consider as basic topics about us native (indio)/ Malay Filipinos. This link/listing, which may later expand, will always be presented at the bottom of each future post. Just point-and-click at each listed item to open and read.